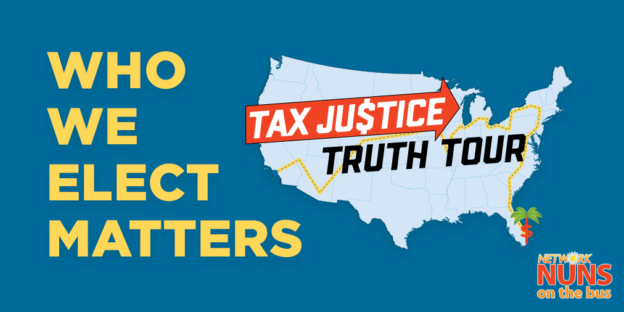 Editor’s note: before embarking on NETWORK’s 2018 Nuns on the Bus trip, the “Tax Justice Truth Tour,” Sister Simone and Sister Mary Ellen traveled to bring one of the main programs – our Town Hall for Tax Justice – to the Twin Cities. This reflection is from those participants. We attended a “Town Hall for Tax Justice” with Sister Simone Campbell and Sister Mary Ellen Lacy on Thursday, September 27th in St. Paul, MN at the Carondelet Center, hosted by the Sisters of St. Joseph of Carondelet (CSJs). The room was filled with religious sisters, consociates of CSJs, and community members. And, of course, we as Saint Joseph Workers were present as well. This event gave us a unique opportunity to see – both visually and through personal narrative – how much the 2017 Tax Bill affects people from a variety of economic backgrounds. We volunteered to help with an activity to demonstrate how the disparity between different economic levels has widened from 1979 to the present, and how the current 2017 Tax Law only widens that gap in inequality. Seven volunteers from the crowd represented a different economic perspective – one for each quintile and one for the top 1%. Each volunteer had a name and a story. We represented the two lowest quintiles, the next quintile was the “middle” middle class, then the higher middle class, followed by the top 1%, and then a corporation. We started in the year 1979, with participants standing together. As “time” passed, participants were asked to walk farther away from each other – showcasing the gap widening between economic levels. Once the 2017 Tax Law was put into effect in the activity, the 1% and the corporation not only widened the gap by walking away from the lower economic quintiles, but the lower quintiles also walked away from the middle and more towards the poorer end of the spectrum. There wasn’t even enough room in the hall to show how far the gap would really be. The rich becoming richer and the poor becoming poorer is clearly an understatement. How is your community impacted? What would the common good look like? Reactions around the room were unanimous in their disgust of the effects that the 2017 Tax Law has. What surprised many was just how badly it will impact people. Many were not pleased with the fact that 4% of corporations were projected to raise wages for workers, but in reality only 2.2% have actually raised wages. Companies are not raising wages “out of the goodness of their own heart,” as trickle-down economics would suggest. With fewer taxes being collected, this also impacts public assistance programs that the lower quintiles will need to utilize in order to continue their current quality of living. Programs will accept fewer people or will be shut down completely, because money will be floating around in the pockets of the rich and not in public funding. This will impact communities negatively – people will struggle to upkeep their housing, lose housing, or could face not having enough food on the table. This Town Hall was so important because not only did it shed light on the negative impacts of the 2017 Tax Law, it invited us – in light of the realities of the law – to reflect on what the common good would look like for all. So, what is a tax policy that honors and respects the common good? What does tax justice really look like? Many people present at this event offered suggestions, and Sr. Simone and Sr. Mary Ellen also offered suggestions. An answer rooted in Catholic Social Teaching of caring for one another and of the Earth is a good direction, yet how we accomplish this goal through public tax policy is a difficult question to answer. What we do know is that the 2017 Tax Law does not accomplish the common good, and laws do not have to be permanent. We can work together towards creating a tax policy that takes care of everyone. An important take-away for us was that this kind of dialogue needs to continue to happen and people need to take action through exercising their political rights. We are inspired by this experience, knowing that in order to continue moving towards the common good, we must continue to educate ourselves on tax policy and its effects on all economic classes. In order to work towards the common good, we must come to the middle ground. We must not only consider how taxes affect the lower, middle and upper classes: we must get to know all sides of the story. Hanna Potter and Ceara Curry are current members of the St. Joseph Worker Program, a year-long service opportunity through the Sisters of St. Joseph of Carondelet. Hanna and Ceara are St. Joseph Workers in the Twin Cities, and recently attended NETWORK’s Town Hall event at the Carondelet Center in St. Paul, MN. This entry was posted in Emerging Justice Seekers, Front Page on October 2, 2018 by lindsay.